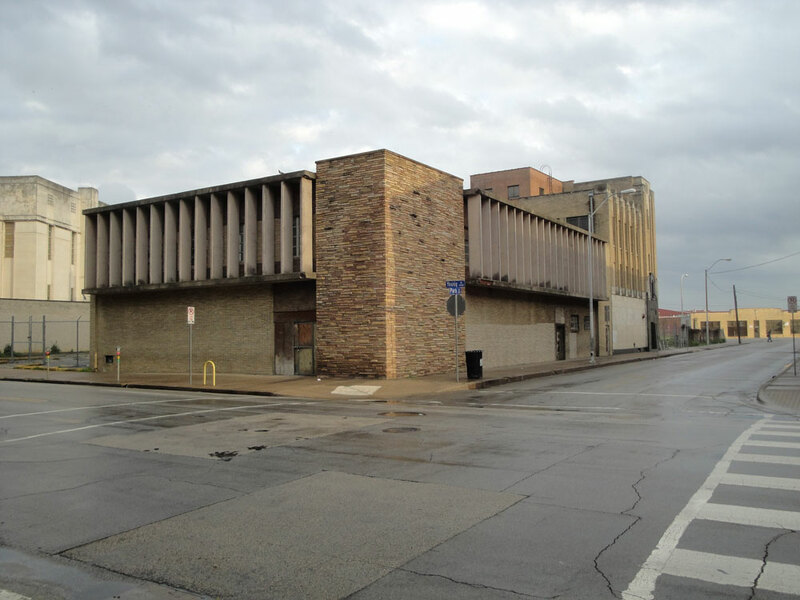 As mentioned in a previous post, the removal of the Columbia Pictures Building / 1900 Young Street is one component of the project to redevelop and restore neighboring 508 Park Avenue. 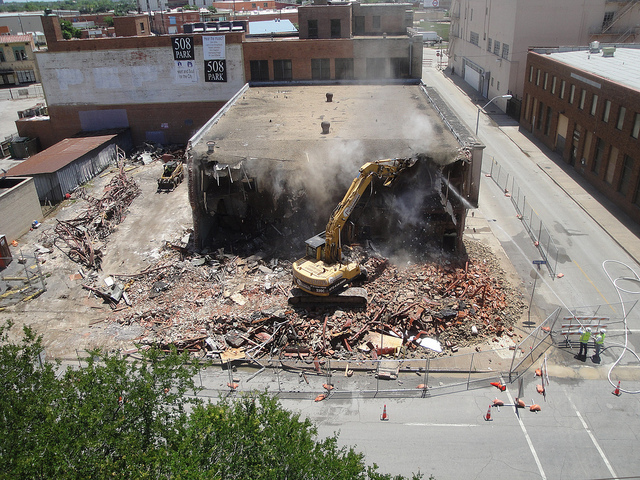 On Sunday, April 22 the building at the corner of Young and Park Avenue was demolished. 1900 Young wasn’t particularly ornate or historic, but its 1950s design was a good example of the diversity of architecture in the Harwood Historic District. The building was designed for practical storage of highly-flammable films for Columbia Pictures; regional offices benefited from windows on the second floor. Vertical concrete fins and a limestone corner were the dominant features of the structure. It was significant in that it was one of a few remaining film exchange buildings, but years as a storage facility and squatter’s refuge had taken its toll on the building. 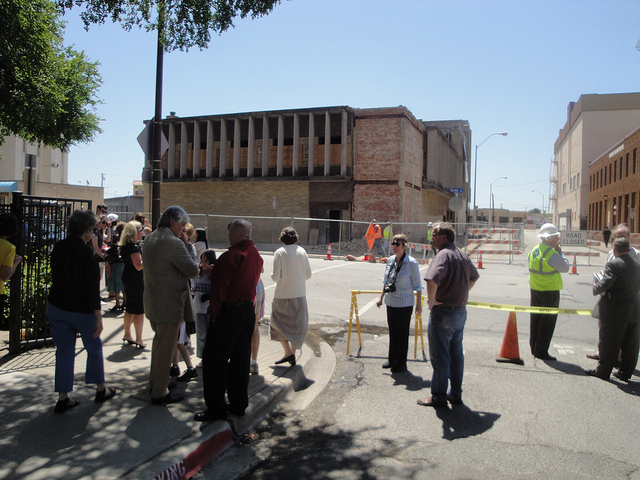 Demolition began at noon as part of First Presbyterian Church’s celebration to officially begin the 508 Park project. A band provided the soundtrack as wreckers from Precision Demolition moved in; within minutes the building began to crumble. 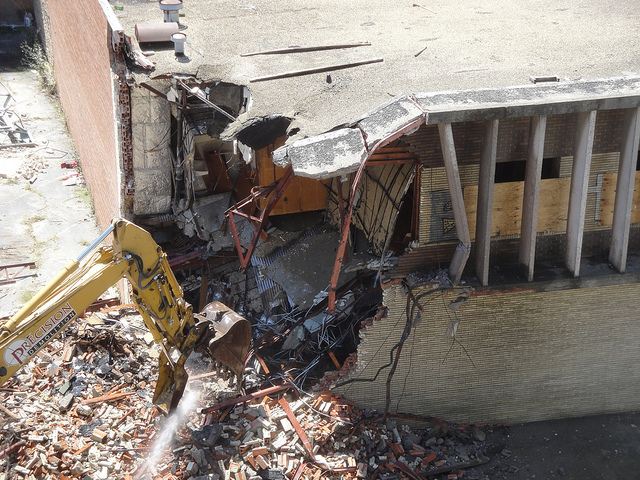 Beginning at the eastern end of the building, the machine chewed into the brick and steel structure. The crowds watching from an adjacent sidewalk cheered as vertical concrete fins and debris crashed to the ground. 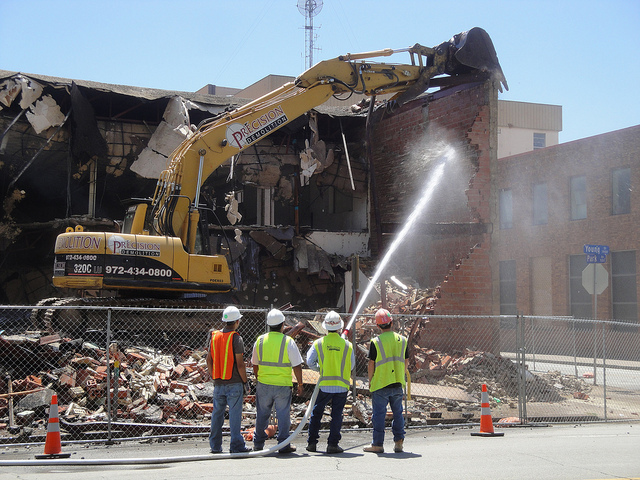 Demolition crews worked quickly, and within an hour the Young Street frontage was a pile of rubble. As part of the plan to reference the history of the site, the limestone corner was dismantled before demolition to be reconstructed in the same location. This — along with other elements — will preserve some of the building’s street presence and serve as an entry pylon to the new development. Workers continued the demolition throughout the day. By nightfall, the building was completely demolished and windows on neighboring 508 Park — long hidden — were once again exposed. Once the site is cleared, work will begin on the transformation of the site into an outdoor ampitheater. This — along with work at 508 Park and the adjacent lot — will provide many new opportunities for The Stewpot and the community. 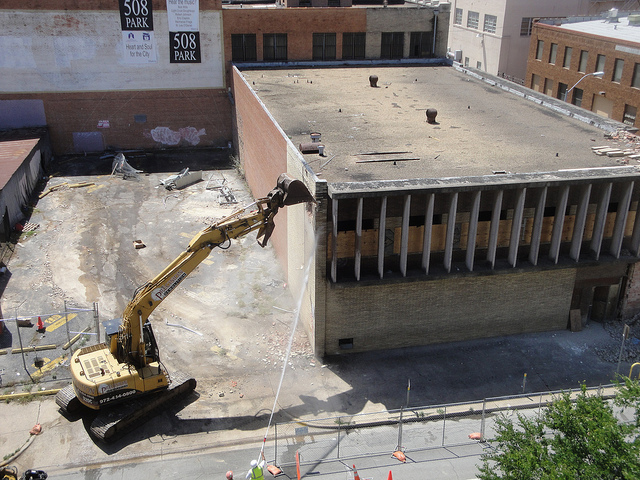 View more photos or watch video of the demolition below. 5 Responses to "Columbia Pictures Building"
It is a shame this building had to be demolished. However, I have total confidence in the Church and know it is for the betterment of the city. 1900 Young was Columbia. 508 Park was Warner Bros.